Summer 2018 is All About Features You Asked For! Summer 2018 has been a busy time at Photomyne. We've worked hard on numerous tweaks and improvements. 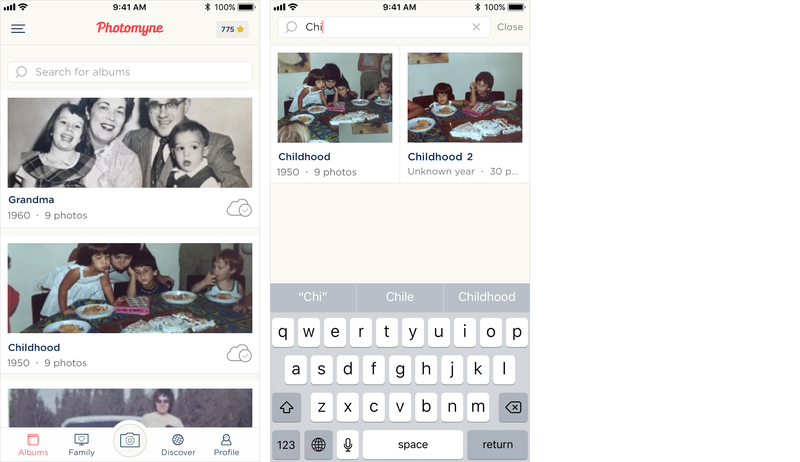 Now, we're excited to share some of the recent updates we made to the Photomyne app, available in the latest iOS release (version 14.0). Almost all of these updates are features you requested from us. We're happy to oblige because it helps to make your photo memory preservation process as seamless and gratifying as possible. Yes! You can now search for albums by entering their title (even just part of the first word) or a year. This is particularly helpful if you've scanned quite a few albums. Use the search box to quickly navigate to a specific album of your choosing, instead of scrolling all the way down to find it. This is yet another popular request we received from you. Until now, new albums were created only by scanning new photos. Scanned a bunch of photos and some of them deserve their own separate album? No problem. Go to the album with the photos you'd like to move. 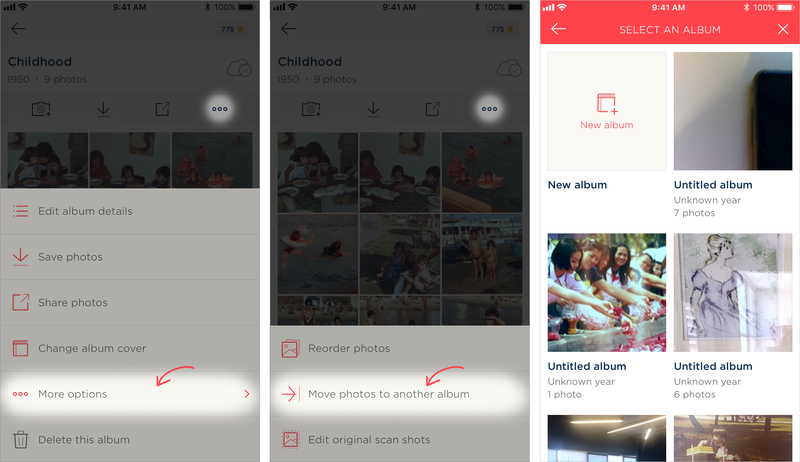 Tap the 3-dot options menu and select More options > Move photos to another album > Select the photos you wish to move, and then choose the New album as the destination. Name that new album and you're all set - the photos have moved to a new album of your choice. This is a premium feature available only to active Photomyne account members. 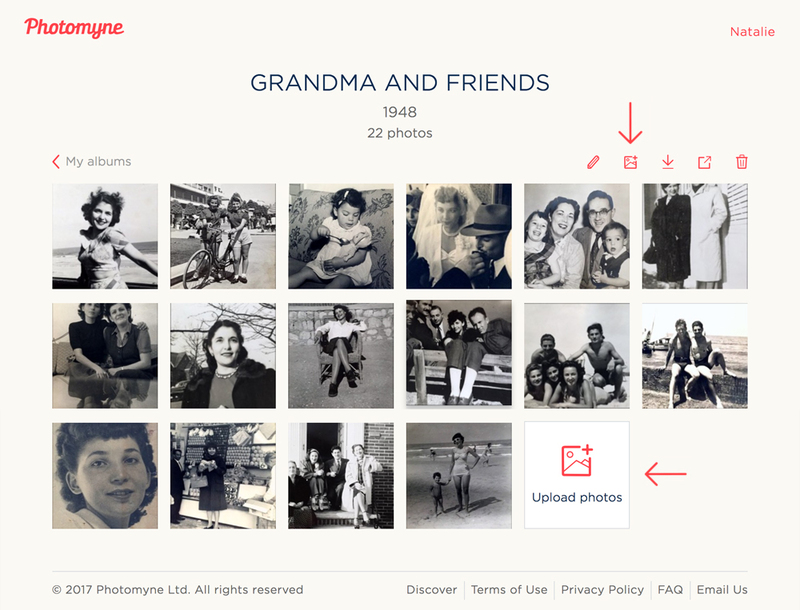 Instantly transfer photo files from your computer's hard drive (or any other folder) into your Photomyne account - and these will sync with the app. All you need is to log in online. Want to learn more? You're welcome to visit this step-by-step guide on how to use the online photo upload option. 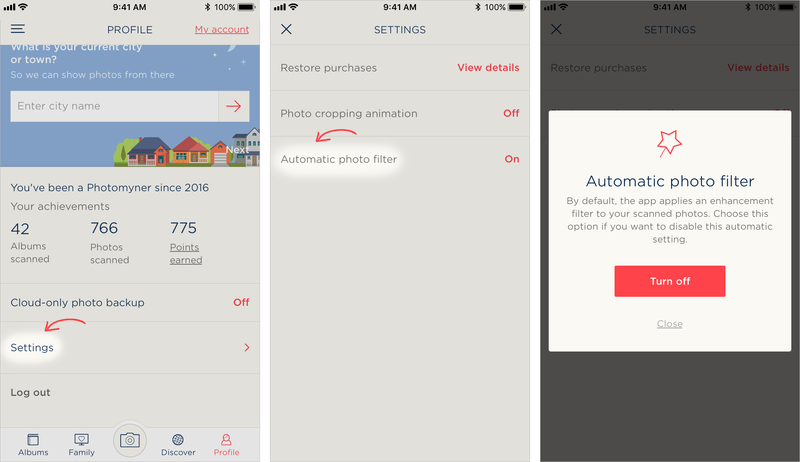 Until now (Aug '18), the app would automatically apply an enhancement filter to each photo you scanned and saved. In most cases this automatic filter improved the photo's look and feel. In some other cases it gave photos a blue tint that took away from the original photo's vintage colors. Please note that turning it off won't apply to photos you already scanned and saved. Rather, it will no longer apply it to any future scans from that point on. Great photo memories often come in greyscale. Now you have the option to add colors to your black & white photos with a special new feature in the app. 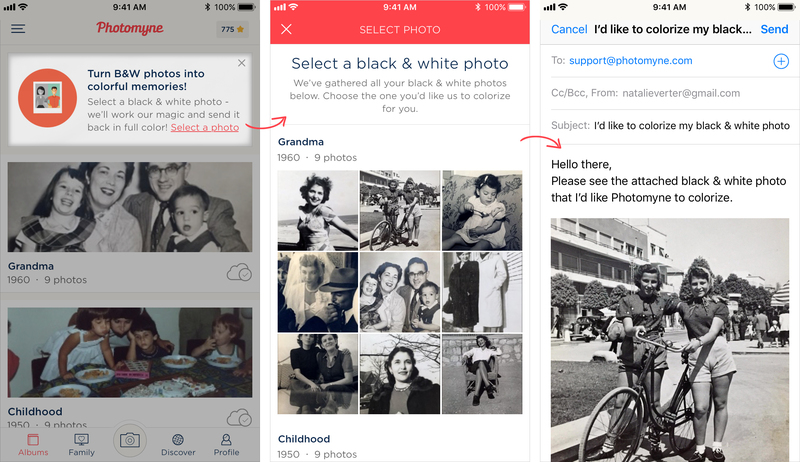 One of the messages on top of the Albums screen will invite you to select one of your photos and have it colorized by us. Once you select a photo, the app will create an email message which will automatically be sent to us once you hit the Send button. We'll email it back within 24 hours, all colorized and beautiful! That's it for this round of new features in the app. Have a special request of your own? Want to give us feedback on the Photomyne app? We'd love to hear it - send us an email and let us know.